So sometimes I mix up a bunch of cookie dough and freeze it, other times I bake and freeze whole cookies. But there are still other times, when I simply reach for a box…or in this case, a bag. It’s just easier that way! I’m not above a good store-bought mix! I know it’s not the best option, and it’s certainly not organic or all natural…but it IS simple! Plus, I alway add something to make it look a little fancier and more homemade, like my Triple Chocolate Bundt Cake and my Monster Brownies — both of which are huge favorites around here! And now I have a third favorite! Yesterday, I ate our last cookie around 10:00am and figured I should probably make more. So I pulled out a bag of Betty Crocker’s Peanut Butter cookies…but I wanted some chocolate. 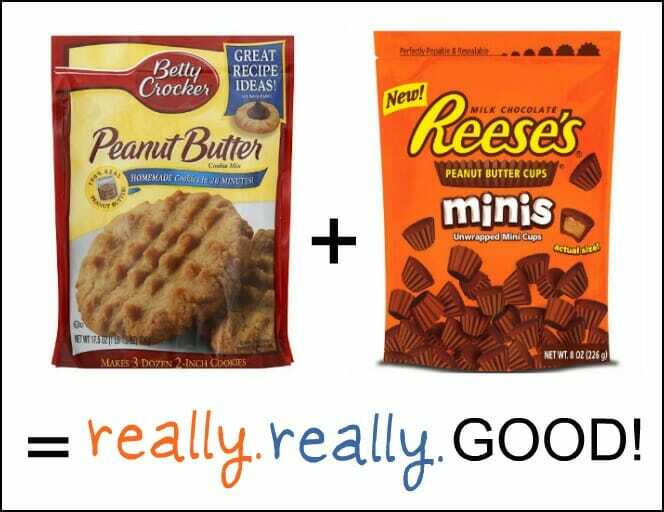 And that’s when I remember the bag of Reese’s minis stashed in our freezer. Anyway, I mixed up the cookies, added the Resse’s minis, baked, and enjoyed. Several times throughout the day. And I had a few more already this morning. OK, I need to stop eating these! What are your favorite “from-the-box” recipes? So I’m a little late to this party, but wanted to thank you for the mix-in idea! It made me wonder what other easy, evil desserts I could make with this candy… so I just pulled a pan of “Reese’s mini’s” brownies out of the oven! We’re planning to top them with peanut butter frosting that I’ll ‘make’ by stirring creamy peanut butter into a tub of vanilla (and we’ll maybe add a few more mini’s if the mood strikes!). Hooray! I would have made these the same day you posted this but somehow my store was out of the peanut butter cookie mix. Anyway, finally found it, made them and YUMMMM!!! I’m not much of a baker, so using the mix is genius. And yes, as another commenter said, these ARE a little too easy to make. Must. Resist. Going. Down. Baking. Aisle. Aaahhhhhhhhh!! I finally broke down at Christmas (needed 12 dozen cookies for an exchange and not much time) and bought the oatmeal cookie mix. I add a teaspoon each of vanilla and almond extract, 1 1/2 cups butterscotch chips and a cup of roasted, salted cashews. 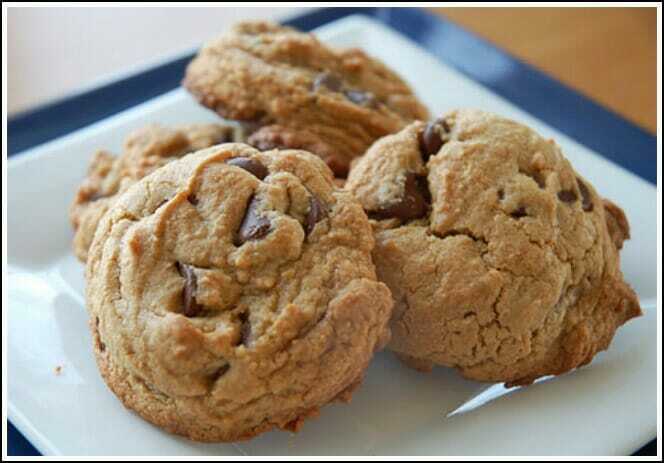 Have made them many times since, adding coconut, choc chips and pecans to one batch to change it up. No one guessed they were from a mix! I’m making these right now for our Spring Break trip to a ranch here in Texas. 6 adults, 13 kids and PLENTY of cookies!! Thanks! Wow…that’s a lot of people! I know the cookies will go over well. My favorite super-easy recipe is for the Hungry Girl brownie muffins–all you do is mix a box of devils food cake mix with canned pumpkin (15oz) & bake. It’s super thick when it’s mixed together, but that’s how it’s supposed to be–on her website, she warns you not to add anything else to thin it out or it will ruin it, & I can attest that it’s great as is. Yummy!!! Yum, that DOES sound delicious…and I have both ingredients in the house! haha…agreed! And thanks for that link Betsy! My favorite box mix is Ghiardelli’s Dark Chocolate Brownies with chocolate chips. I usually bake everything from scratch but this mix is so good, I may never bake brownies from scratch again. They are really moist and flavorful. Here’s a cookie tip: I scoop out the cookie dough onto a baking sheet and stick it in the freezer. When the scoops are frozen, I pour them into a bag in the freezer and this way, I can bake one sheet at a time whenever I want a warm gooey cookie straight from the oven. I have frozen “balls” of cookie dough before, but I never thought to freeze individual bags for each cookie sheet — that makes so much sense! I’ve been wanting to try those minis! This looks great. What’s better than chocolate? Chocolate with peanut butter! I may have to make an emergency trip to the store today! Thanks for the idea.